Kyle, like many students, changed majors in college. He started off in Political Science but realized there wasn’t much of a career path for him. He changed his major to Education, but this was more time consuming than he preferred. He then landed in Public Relations, which he still does and enjoys. However, Kyle wanted to be doing more. One thing Kyle realized in each of his jobs was how very unhappy people are in who they become. Why is this? We all know we are going to work full time in some sort of career. How are we so unprepared for it? The findings showed that college graduates were unprepared, in debt, and not in jobs that were tied to their major. This research is what launched Kyle into his speaking career and was the founding inspiration for his book To the Next Step coming out in May. Kyle encourages kids to instead think about what brings them pride and satisfaction. Then finding jobs that align with that. In preparing kids for life on their own, Kyle has them make a list of everything their parents do for them. Then he tells them to pick one item from that list and master it. Once they master that skill, pick another item off the list and master it. This could be doing laundry, creating a budget, or getting yourself up every morning, just to name a few. Kyle tells kids by doing this, you are softening the blow when you move out. You can be as prepared as possible, but there will always be things that come up that you’re not prepared to handle. 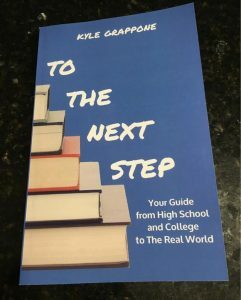 In his book, To the Next Step, it’s all about preparing kids for their next steps in life. It’s about helping them see the parts of life they don’t see coming and why they should care about it. His book includes guided questions to help kids define the person they want to be and what type of environment they thrive in. Kyle also talks about the college selection process and helping kids determine what makes it worth the price, questions to ask on campus tours, and preparing for graduation and the first year in the workforce. You can watch my full interview with Kyle Grappone here. He goes more in detail with some of the steps and action items for kids in planning for their future. Kyle’s book will be available on Amazon in May. What do you think about Kyle’s idea of kids making a master list? What tasks do you do for your child that they should start taking on? Tell us in the comments below.